"Introduction: Towards a Model of Arbitration Reform in the Asia Pacific"
in Anselmo Reyes and Weixia Gu (eds), The Developing World of Arbitration - A Comparative Study of Arbitration Reform in the Asia Pacific (Hart Publishing, January 2018), pp. 1-16. Since the turn of the twentieth century, international commercial arbitration has flourished and prospered across the Asia Pacific. 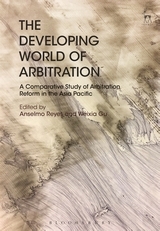 The development of international arbitration as a mechanism for commercial dispute resolution has not only mirrored, but also responded to, the commercial needs of continuing economic development within Asia Pacific jurisdictions. Attracting foreign investment and boosting commercial confidence, whether in the short or long term, will typically necessitate the institution of efficient and effective dispute resolution mechanisms to handle the differences that inevitably arise as a matter of cross-border business. Given that outside investors may be wary of the impartiality of domestic courts in resolving cross-border commercial disputes, it is natural that arbitration has found itself uniquely situated in Asia Pacific jurisdictions as a preferred mode of dispute resolution, as well as a magnet for foreign investment within a given state. The steady growth of international commercial arbitration in Asia is reflected by the numbers. Since 2008, the total number of arbitrations handled by key international arbitration institutions in the Asia Pacific has continuously exceeded the number of cases handled by similar institutions in the West. The establishment of key institutions from the Korean Commercial Arbitration Board in Northeast Asia, to the Singapore International Arbitration Centre and the Kuala Lumpur Regional Centre for Arbitration in Southeast Asia, and to the Australian Centre for International Commercial Arbitration in the Pacific, coupled with the ongoing consolidation of the China International Economic and Trade Arbitration Commission in China, has raised the presence and standing of international commercial arbitration as a form of dispute resolution in the Asia Pacific.